We all want reviews – lots of them and good ones. Some of us write in popular genres, have long email lists and no problem getting reviews in their many tens or more. The rest of us struggle – we ask our friends, our dentist and anyone we can think of until they look a bit bored. That’s why I want to tell you about my experiences on NetGalley. 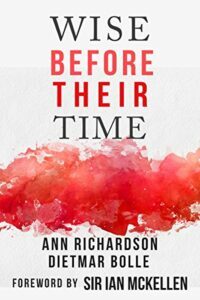 I decided, as a micro-publisher, to place one of my books on it earlier this year as it has serious reviewers – librarians, journalists, academics and others who love to read – and, from my experience, they write thoughtful reviews. I write books that don’t fit easily in any genre – based on confidential interviews, they enable people to talk about their lives in their own words and from the heart. The one I placed with NetGalley through BooksGoSocial, Life in a Hospice, is about nurses and others working in end-of-life care. And what happened? In one month, I received 12 reviews, of which 10 were 5 star. BGS offers a placement with NetGalley at a bargain price. Why not have a go? Life in a Hospice – Hey, you! Hey you – yes you! I see you rushing off. You see the word ‘hospice’ and you think death, gloomy, morbid – not for me. You search for a good crime novel instead. No death there, of course. But Life in a Hospice is anything but gloomy. It is a book of stories, told from the heart. And from all sorts of viewpoints. Perhaps the most important word is “life”. You want a story with a bit of love? There’s more love in a hospice than anywhere in the world. You have an urge to be moved? Yes, of course, when talking about the end of life, that goes without question. You want to see the complexity of human relationships? For sure, that is there in abundance. Some humour? You won’t be disappointed. You may be surprised. Life in a hospice shows what it is like to work in a hospice and, by extension, what it is like to be a hospice patient or visiting relative. It is told in their own words by nurses, assistants, chaplains, doctors, managers and even a very thoughtful hospice cook. They tell of the withdrawn woman who blossomed under the care of the day centre. There is the man who asked to die under a tree – and they arranged it. There are the two young daughters who asked for their father to be buried with some cigarettes and a can of lager. Throughout, there is the enormous sense of ‘privilege’ to be working in a hospice. Yes, it is about death and dying, but as you’ve never seen it before. Hospices are teeming with life – with love, laughter, arguments and tears. To quote a cliché, “all life is there”. And if, perchance, you are wondering where you should go when your last days or near – or, indeed, are helping a relative or friend to find such a place – you will be enormously reassured. Reviews? You can bet they were excellent. Now maybe that was worth staying for. Life in a Hospice was initially published in 2007 with some good reviews and an endorsement from the British Medical Association. But despite its continuing relevance to people everywhere, it fell into a fallow period, with few sales and certainly no more reviews. Imagine my pleasure, then, when I find that the relaunched version (a year ago, spring 2017) is selling well and getting one excellent review after another. It does a writer’s heart good to see such a welcome for her hard work and commitment. 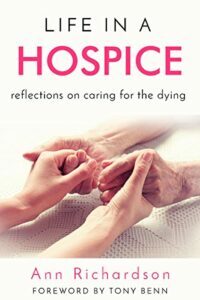 Life in a Hospice, my book which goes behind the scenes in two hospices to show readers how it feels to provide end-of-life care, was first published in 2007. I re-launched it last March. This is because the publishers were charging much too much for it and giving it no publicity – with the not surprising result that no one was buying it. It was selling one or two copies a year. I thought a few people might want to read it and decided to give it a new cover and a revised introduction and make it available to potential readers at a reasonable price. I thought 50 or 60 people, at a completely rough guess, might be interested. But I was so wrong. No, I have been selling one or so copies a day on Amazon – indeed, well over 200 copies since its relaunch. Mostly e-books, but some paperbacks as well. This is not big numbers compared to Harry Potter or a few other things I could name, but it is surprisingly successful. A friend who is a writer said he wished he could see such sales. Who is reading it? I don’t actually know. I would imagine many will be current hospice workers, who like to hear about others doing similar work. Or those who are interested in pursuing hospice care as a career (it’s a very good introduction to this, because it talks about not only what workers do but also how such work affects their lives). Some people who are considering hospice care for someone in their family may be reading it, too. I personally think it makes inspirational reading, showing humanity at its best. Perhaps some readers are looking for that. I am now making it available as an e-book in other outlets besides Amazon, such as Apple ibooks, Kobo and Barnes and Noble.